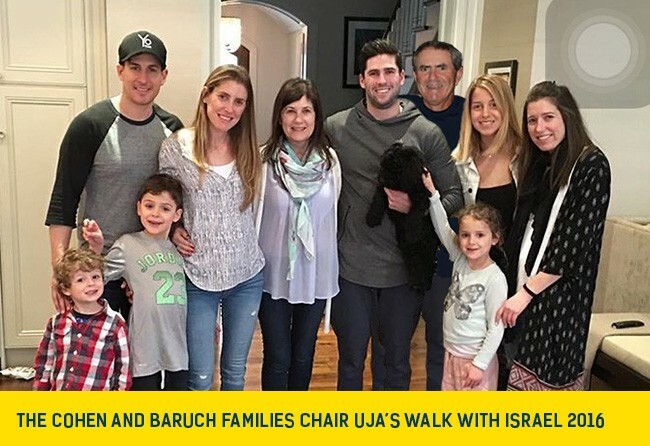 Ardent and proud Zionists, Andrea and Trevor Cohen, who, along with their five children and three grandchildren are chairing this year’s UJA Walk with Israel on Sunday, May 29th, are having way too much fun. First held in May 1970, UJA’s Walk with Israel, which will celebrate its 46th year on Sunday, May 29th, has become the signature event of its kind in Toronto’s Jewish community. Transforming the streets of downtown Toronto into a sea of blue and white, and red and white, the 2015 Walk reached record heights with over 17,000 people participating as volunteers or walkers, providing our community with a collective voice to demonstrate our solidarity with, and love for, the people of Israel. Last year, the Walk, which is sponsored by RioCan REIT, raised over $900,000 for social services and educational initiatives throughout Israel, while attracting political leaders and representatives from across Canada’s full political spectrum. Now in its second year, UJA’s 8 kilometer Run with Israel, sponsored by Yogen Fruz, begins 15 minutes before the Walk with Israel, which leaves Coronation Park at 10:00 a.m. This year’s Run with Israel is being chaired by Jordan Korenzvit and Sam Mizrahi. Andrea and Trevor, who immigrated to Canada from their native South Africa when their eldest daughter, Tammy, now 36, was just 16 months old, began their involvement with UJA aboard the organization’s Family Mission to Israel in 1997, and they haven’t looked back since. Once you and your team have completed this year's Walk or Run with Israel, there's no better way to celebrate your efforts on behalf of the people of Israel than by relaxing at the Renee & Irwin Nadal Festival. The Festival is one of the highlights of the Walk year after year, with something for everyone. The Festival features many exciting activities, and snacks, including a Kosher BBQ, Live Entertainment, carnival rides, an arts and crafts centre, teen zone and much more. Remember, in order to be admitted to the Renee & Irwin Nadal Festival you must be wearing your 2016 Walk with Israel lanyard. Lanyards will only be given to registrants who fundraise. If you do not wish to fundraise, individual and family registration packages will be available at the beginning of May for purchase.